All the spoilers all the time. You have been warned! This was a trippy movie that was about a man who fought in Nam and returns home to delusions… or is it? It was not as much “horror” as it was psychological thriller. I may have fell asleep a little. Macaulay Calkin was in it! I have to watch again…. IMDB Synopsis: Mourning his dead child, a haunted Vietnam War veteran attempts to uncover his past while suffering from a severe case of dissociation. To do so, he must decipher reality and life from his own dreams, delusions, and perceptions of death. 40-59 Levels of: I don’t hate it? 60-85 Levels of: That was solid. 86-100 Levels of: I Loved It! I rank this movie a ! It received a Rotten Tomatoes rating of 70% Fresh. It received a Rotten Tomato audience rating of 84% liking it. Average Rating: 3.7/5 with a number of User Ratings: 52,930. Certain imagery was inspired by the photographs of Joel-Peter Witkin. Most recognizably, the image of the hooded, legless man shaking his head is inspired by Witkin’s 1976 photograph “Man With No Legs”. All SFX were filmed live, with no post-production. For example, to achieve the famous ‘shaking head’ effect, director Adrian Lyne simply filmed the actor waving his head around (and keeping his shoulders and the rest of his body completely still) at 4fps, resulting in an incredibly fast and deeply disturbing motion when played back at the normal frame-rate of 24fps. Adrian Lyne turned down directorial duties on The Bonfire of the Vanities (1990) so he could direct Jacob’s Ladder. His first choice for the role of Jacob Singer was Tom Hanks, but, by coincidence, Hanks turned down the film so he could make The Bonfire of the Vanities. When Jacob Singer unfolds an old Army discharge certificate, the service number “US 21 719 365” can briefly be seen. This would correspond to a National Guard service number with a prefix indicating follow-on conscription into the Army of the United States. According to U.S Army records, the service number seen in the film was assigned to a soldier named Thomas K. Wright, who served from 1959 to 1961 with discharge as a Specialist-4 (paygrade E4). Thomas Wright would later become the property master for the film Jacob’s Ladder, using his own service number for the scene where the discharge certificate is briefly visible on camera. The hospital gurney that carries Jacob was deliberately unbalanced by Adrian Lyne. He raised one wheel slightly off the floor, causing it to rattle and spin. Don Johnson and Mickey Rourke both turned down the lead role. The closing legend of the film mentions the testing of a drug named BZ in Vietnam. BZ is NATO code for a hallucinogen called 3-quinuclidinyl benzilate, which was rumored to have been administered to US troops during the Vietnam War in an attempt to increase their combat abilities. 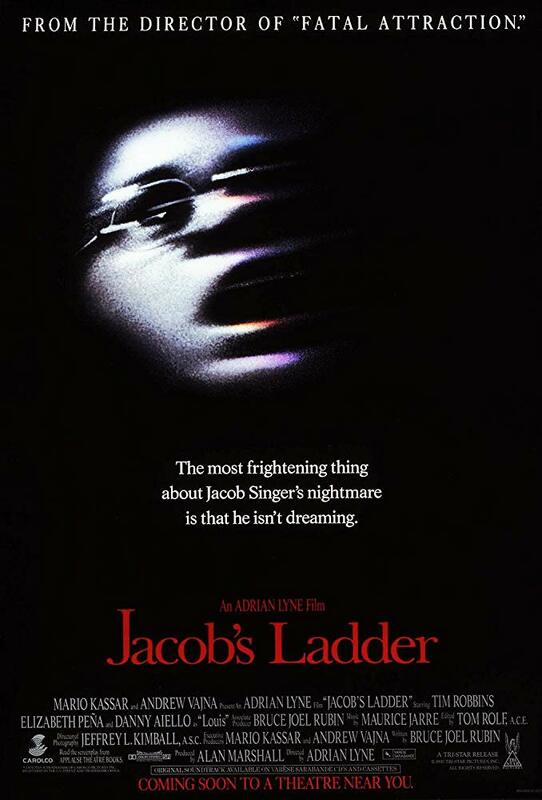 Adrian Lyne made sure Jacob and his visions never appear together in the same shot.